One of the charging stations installed at Hyundai’s employee parking lot through SCE’s Charge Ready pilot program. SCE Senior Vice President Caroline Choi is interviewed about SCE’s role and vision for accelerating the adoption of electric vehicles. The Hyundai Motor America headquarters building in Fountain Valley. Electric vehicle charging in Hyundai Motor America’s employee parking lot. Many of the EV charging stations are part of SCE’s Charge Ready pilot program. 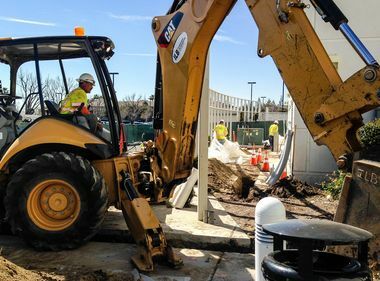 More employees at Hyundai Motor America’s Fountain Valley headquarters who drive electric cars will be able to plug in at work, thanks to a Southern California Edison program. On Thursday, Hyundai celebrated the installation of 113 electric vehicle charging stations, 73 of which were made possible through SCE’s Charge Ready pilot program. 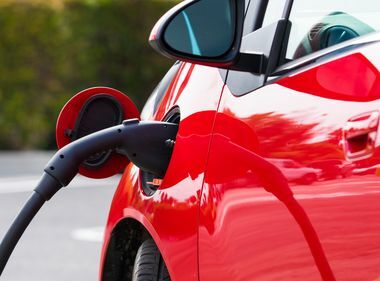 Charge Ready provides infrastructure for hundreds of electric vehicle charging stations at locations where people park their cars for extended periods of time, such as apartment and condominium complexes, schools, recreation areas and workplaces. 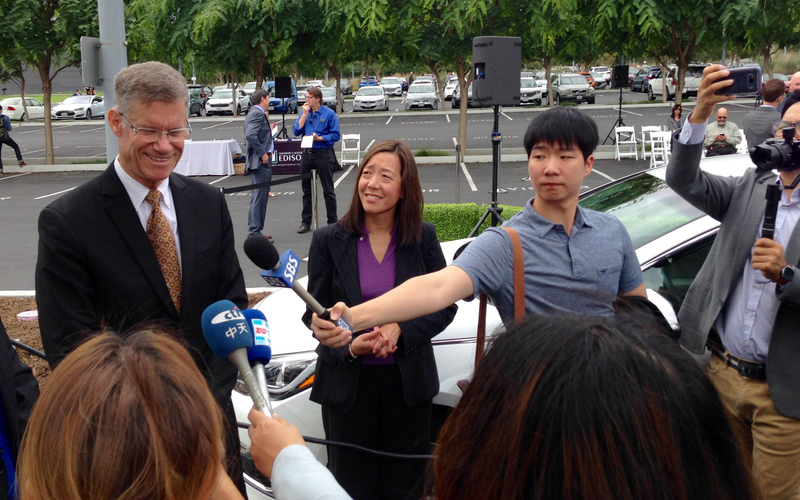 Hyundai Motor America Vice President Mike O’Brien and Caroline Choi, SCE senior vice president, take questions from the media about the new employee charging stations. “A hundred charging stations would’ve seemed like a waste of parking just a few years ago,” said Mike O’Brien, Hyundai’s vice president of Planning, at Hyundai’s Charging Century, an event Thursday celebrating the installation of the charging stations. “Now they’re barely enough. About 5 percent of the 700 employees at Hyundai’s Fountain Valley headquarters drive electric vehicles. The auto manufacturer offers one electric and two plug-in hybrid models. California is only 13 years away from its goal of reducing greenhouse gas emissions to 40 percent below 1990 levels by 2030. “And we need to electrify the transportation sector more rapidly in order to achieve that target,” said Choi. 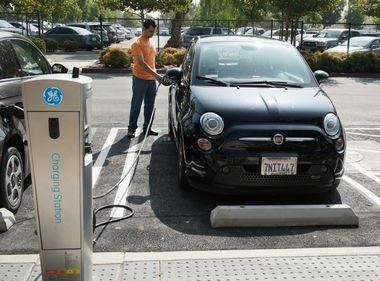 At the conclusion of the Charge Ready pilot, SCE hopes to get approval from the state to expand the program to boost the number of charging stations into the thousands.